yarn with a G hook. I held the poster-sized foam core board level all the way to the foyer. Shoving the front door open with my hip, I inched open the screen door with my toe then gave it a kick. It swung wide and I stepped onto the porch just as a summer breeze blew all the white glitter that was resting on the foam core into my hair and back through the door and onto the foyer rug. Much swearing could be heard as I dumped the remaining glitter into the yard. I had been covering all my granny stars, made while sitting in the car during our family vacation, with glue and glitter. The results were less than satisfactory. 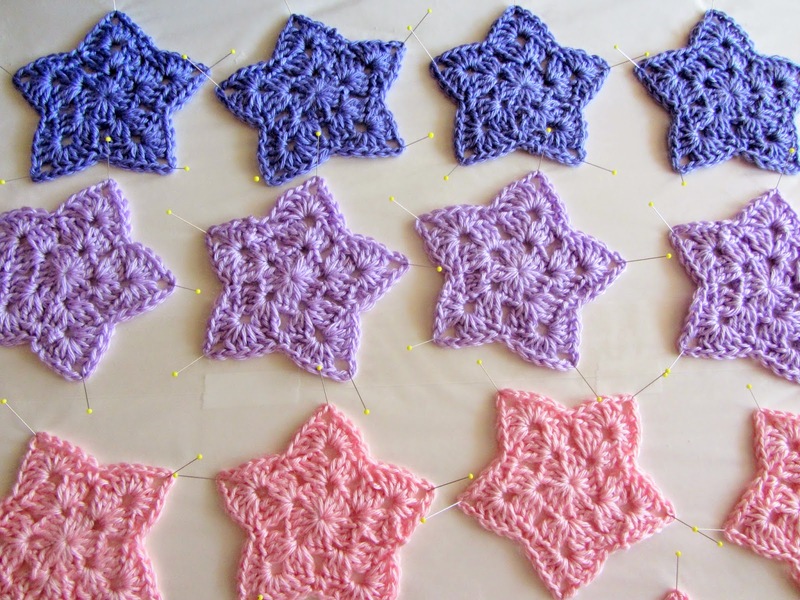 In fact, the pink, lavender, and purple stitched stars looked dumb with white glitter. Terrible. Dorky. After peeling the stiffened projects from the wax paper covered foam core, I scraped off what glitter I could and tossed them into warm water. I soaked most of the glue and glitter off and secured the damp pieces back onto the board to dry. Now what? I wonder how long they will sit all pinned down and waiting on my dining room table. If my granny stars were a piece of writing, they would be tucked in the unfinished side of my writing folder and would probably remain unfinished for a while--at least without a deadline. I still have months before Christmas. Maybe I don't need to add much more than a ribbon. Maybe they don't need a lot of extra decoration. Maybe they are just fine they way they are. For now, I will let them rest on my dining room table. been discontinued already. I used an H (5 mm) hook. After I learned how to make a granny square, I made a lot of them in different sizes using different hooks and different yarns. And because I am still ten years old inside and have a long standing desire to be cool like my older sister who knew how to make granny squares, I wanted to make an afghan. 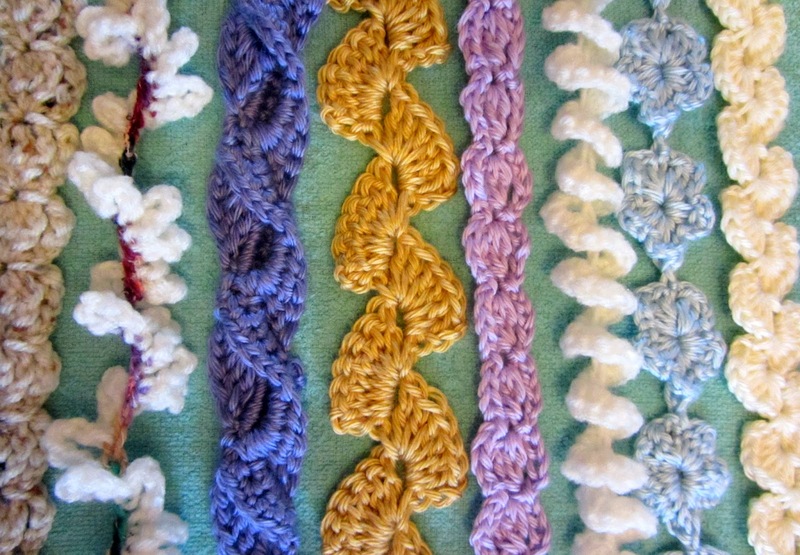 As I was perusing YouTube videos on making and attaching granny squares together, I came across a tutorial from Clare at bobwilson123 for making mile-a-minute strips. The strips used a granny stitch but instead of coming out in a square motif, the pattern produced long panels. 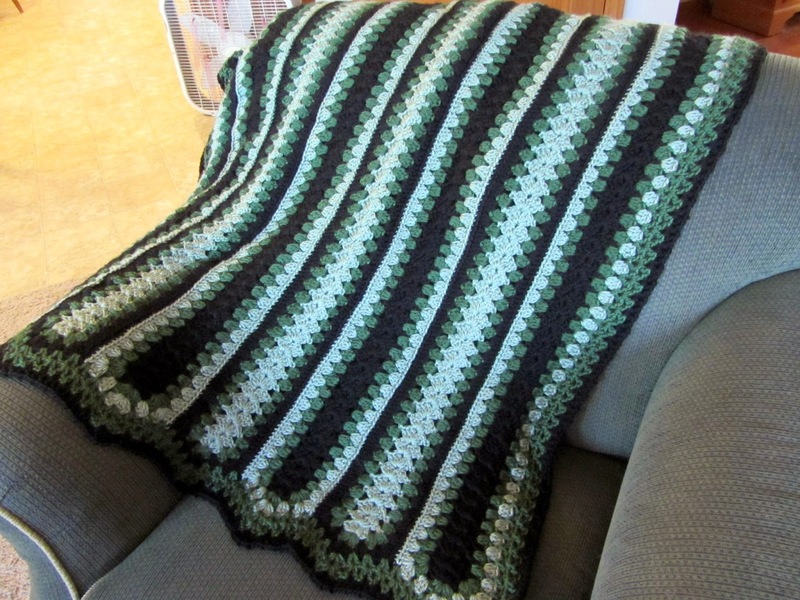 Once I figured out how to make the strips, I decided to use it as the pattern for my afghan. Without much planning, I bought several balls of Red Heart Super Saver yarn and started making strip after strip. I must have watched the tutorial a hundred times. 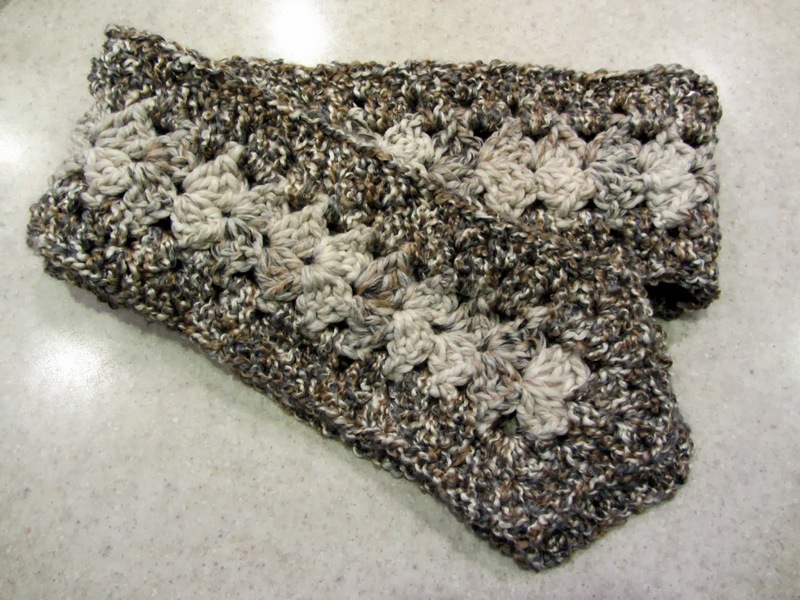 As I double-crocheted, I noticed my stamina and hand strength were improving. I was able to grip the yarn to control the tension with less effort. Every time I got hand cramps, I smiled remembering the kids at school when they were writing like the wind during writing workshop. I often told the children that it wasn't unusual for writers to get hand cramps. In fact, getting hand cramps meant that they must be writing well. Some of the children would rub their hands, pause for drama, and push themselves to keep going. True story. them into lanyards to use for my keys and ID at school. Since returning to crochet, I have spent many hours viewing videos on YouTube. In fact, it was by watching these tutorials that I finally, after all these years, learned how to stitch a granny square. New talented and generous crocheters from across the globe debut their skills on YouTube continuously. As far as I'm concerned, anyone who takes the time to freely share their crochet skills and experiences deserves a round of applause and a positive comment. And videos in foreign languages don't deter me at all. As long as I can see their hands, the yarn, and the hook, I'm willing to watch. I always try to slog through the ads that precede the videos as much as I can because that's how these thoughtful artists make a few bucks. I subscribe to channels I enjoy and also "like" the tutorials. I do need to offer more appreciative comments though. The power of YouTube to promote crochet as both an art and craft is potent. In the past, the only way to really learn how to crochet well was to have a relative or friend available and patient enough to show you. In my view, crochet abilities grow over the course of years, sort of like learning to read or write. The more time you spend with the hook in you hand, the better you get. When I was a teacher of young readers and writers, I used a workshop instructional model to build a child's strategic knowledge, motivation, and stamina for reading because I knew that the more children were engaged in the process of reading and writing, the more capable they became. Just like developing readers need books in their hands, fledgling crocheters need hooks in their hands. Watching YouTube made my crochet development possible. As a learner, if I had to rely strictly on books or written instructions, I would have given up. In fact, watching videos and listening to explanations dozens hundreds of times gave me the big picture I needed to begin to understand written patterns. I consider Clare from bobwilson123, Oana from Oana's Crochet Channel, and Yolanda from the All Crafts Channel among my many YouTube crochet mentors. Pretty cool. The purse design was inspired by Olivia at Girlybunches. Caron Pounder yarn in taupe with an H size hook. 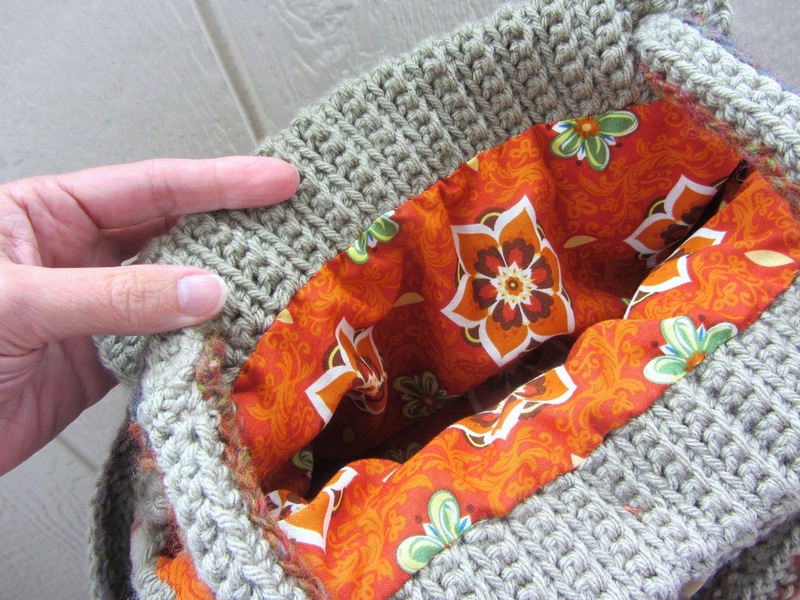 My most recent crochet projects have been bags and purses. I'm not sure why I like making them so much other than they are quicker than sweaters. When I start a crocheted bag, it is always an experiment. I may see a video, pattern, or image of a bag then I synthesize those sensory experiences with yarn, a hook, and my own unique stitch tension that comes from how I hold the yarn and hook in my hands. I am totally fine with someone thinking that my bag or sweater or whatever I make looks handmade . . . because it is. What I make is a piece of me. For me, making is publishing. Making becomes a record of my current interests and skill level. Each piece also tells a story. 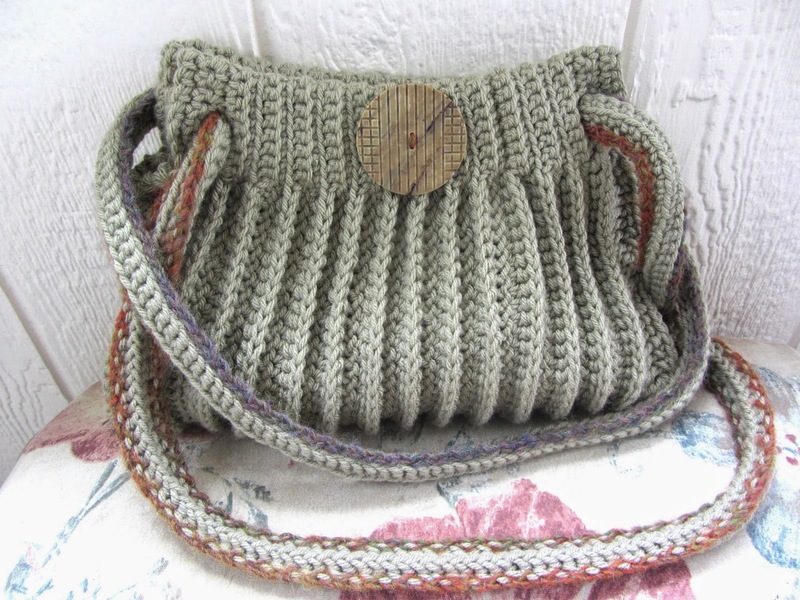 For example, the purse above was made from yarn frogged from a failed attempt to craft a crocheted coat. The coat ended up several sizes too big and each time I tried it on, it seemed to stretch and grow even larger. That was when I learned I needed to understand the interplay between yarn weight, hook size, and stitch pattern before undertaking such a time consuming garment. The stitching on the edges of the shoulder straps came from yarn scraps. The lining material was chosen from hundreds of possible calicoes lined up deliciously at the fabric store. The color and pattern seemed to compliment the handle stitching. And the button--my favorite part of the bag was from the box of treasured buttons I inherited from my grandmother. yarn in taupe with an N (9 mm) hook. I'd say I'm about two thirds done. Still have about a dozen rows to go and then I have to think about a border. I screwed up around the 12th row and forgot to crochet in the front rather than the back loops so they is a funky stitch line but she'll never notice. Most people would never notice, unless the blanket was carefully examined by someone with an eye for detail. I love the yarn, at least I thought I loved the yarn until I researched the care instructions for what I am assuming is Bernat Roving yarn. I am assuming because I found bags of yarn in a mill end bin at Crafts 2000, my favorite place to find discounted yarn. The care instructions are to hand wash and dry flat due to the wool and acrylic fiber content. Wool. I love wool. 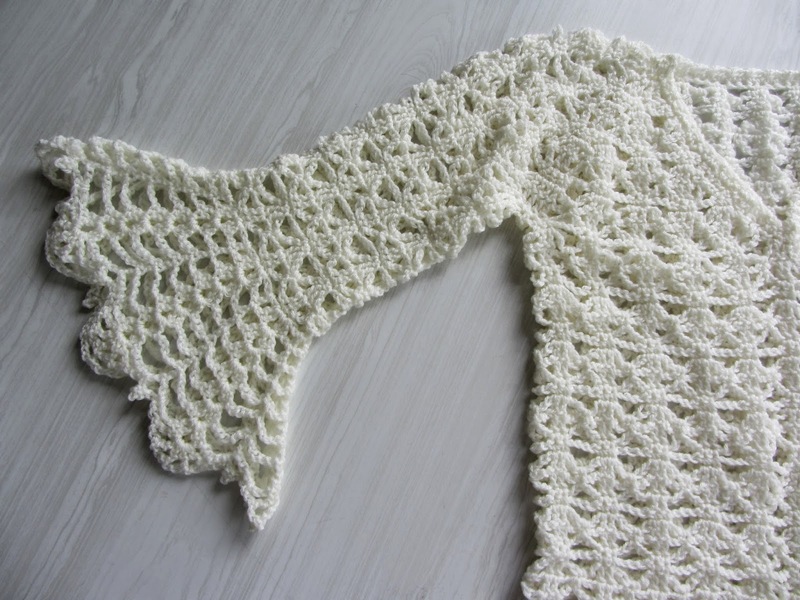 This particular yarn is a single ply and feels so silky and drapey. So, Sam will have to hand wash this blanket. (Like that is going to happen.) Still, at eight bucks for a pound of beautiful yarn, it was hard to resist. The total cost for 3 pounds of yarn for the afghan was $24.00 plus tax. We leave to move her to NYC in just a few days so I need to finish it. So she can have it. For her apartment. In NYC. Far from home. (Big sigh). It isn't that I don't want her to go--I do. Did that sound terrible? This is her dream. She has worked toward this for years. I just want her to be okay. To be safe. And not lonely. And not sad. And to not have regrets. I better get busy. I don't want to have to wrestle with Sam's afghan in the van. Besides, I'd roast to death. When I was a literacy coach, I read widely and ravenously about literacy development and instruction. Over the years, I came to view certain authors as literacy education "rock stars". My language arts geek friends and I would get all giddy over the possibility of meeting folks like Debbie Miller, Lucy Calkins, Ralph Fletcher, Peter Johnston, Jeff Anderson, and "The Sisters" to name a few. I have come to discover that the crochet community also has their rock stars. One of my current favorites is Doris Chan. Besides creating excellently written patterns for sweater designs that actually fit, she is darn funny. Her blog posts are filled with her writing voice and personality. I have never seen her in person but I may someday. And because I respect her talent and experience, I will probably be all wide-eyed and goofy when I do meet her. 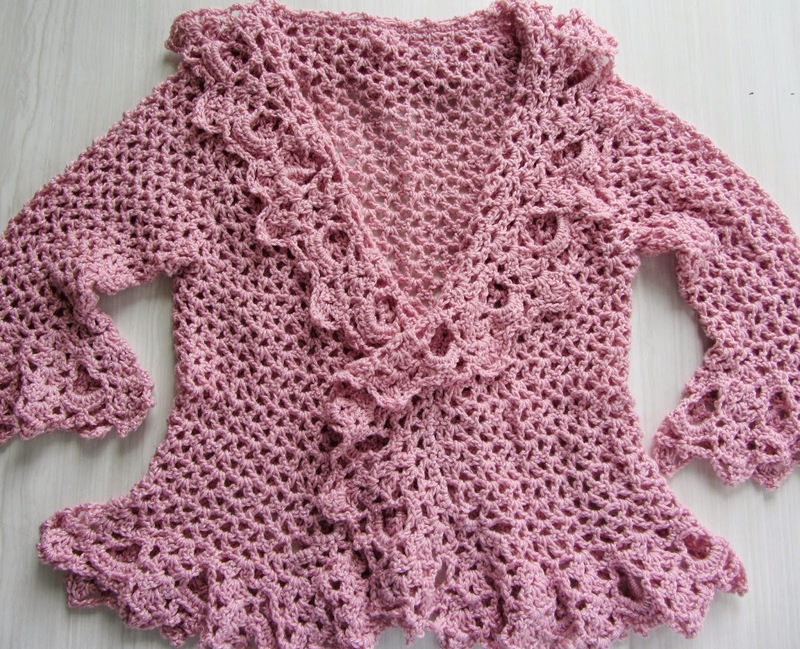 I briefly danced with the idea of attending the Crochet Guild of America (CGOA) Conference in Manchester, New Hampshire this summer but I couldn't justify spending the money--at least not this year. But I do intend to go in another year or so. I am also a proud newbie member of CGOA. Two years ago, I would never have imagined that Everyday Crochet by Doris Chan would be on my bookshelf next to Mechanically Inclined by Jeff Anderson. Weird how things happen. "Are you going to sell all that stuff or what?" "Why are you making all the sweaters? It's like all you do lately." (throat clearing) "Actually, I'm crocheting for lots of reasons." "No biggie, Mom. No lecture needed. I was just curious. See ya." It was and still is a legitimate question. 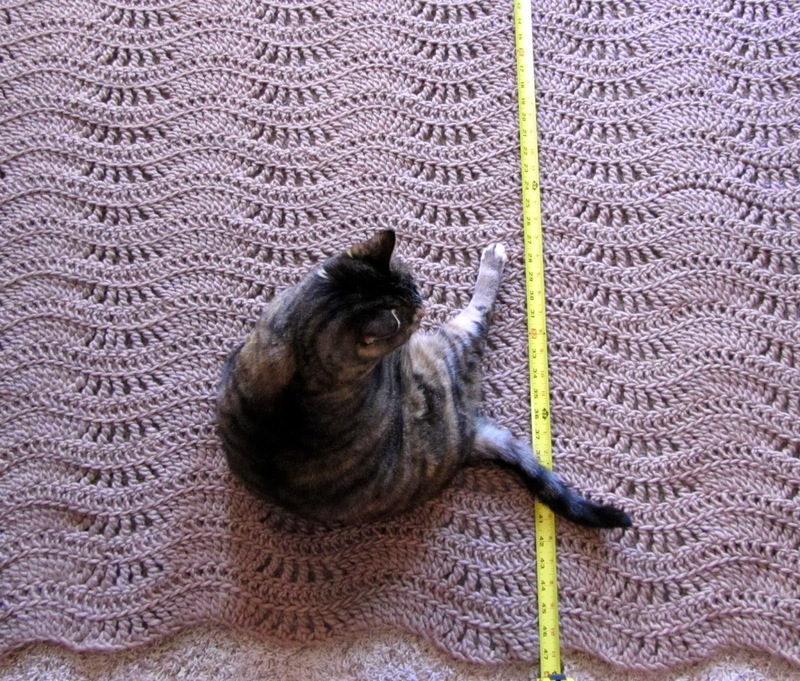 Why crochet or more specifically, why do I crochet? The only people really interested in knowing why a person crochets are other crocheters. It is sort of like teaching, I guess. After almost thirty years in public service as a teacher and speech-language therapist, I am wary about saying much about my profession to those who are not in the business of teaching. I hate even saying, "the business of teaching" because I am living the dream of folks who believe that using business models in schools is a good thing. If I say I don't like the excessive testing and evaluation, I am a whiny teacher who gets summers off so I should shut it. If I say I think the implementation of Common Core State Standards is the result of an unholy relationship between Arne Duncan and Pearson, then I am a radical. So I don't say it. I crochet--a lot. Since I picked up my hooks again last July, I've made numerous sweaters, purses, scarves, baby dresses, booties, and blankets. I have given some items away as gifts but not that much. Maybe because I am a bit weary of giving pieces of myself away. Or maybe I'm afraid of "publishing" my work due to fear of rejection and criticism. My sister, Liz, calls it therapeutic crochet. I think she's right. She gets it. She is an educator too.